WOL.NEWS: MAC Football Remembers Wilkes - Photo Album From Seven Years Ago! MAC Football Remembers Wilkes - Photo Album From Seven Years Ago! 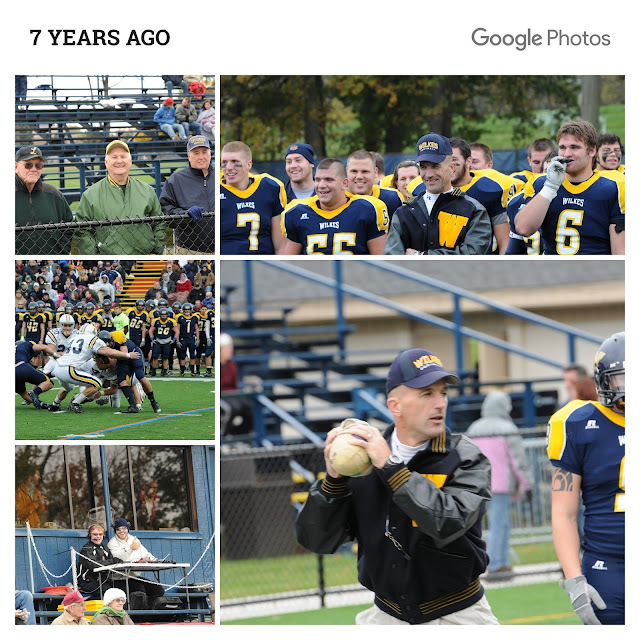 Wilkes Football Photo Album Seven Years Ago! WILKES-BARRE – Zach Tivald (Edison, NJ, Edison) totaled 130 yards and two touchdowns and Kevin Gerhart (Hummelstown, Lower Dauphin)had two interceptions, including one returned 100 yards for a score as Wilkes University used a four-touchdown outburst in the final quarter to defeat Middle Atlantic Conference rival Lycoming College 31-14 college football action on Saturday afternoon at the Ralston Athletic Complex. Tivald ran for just 32 yards on the ground, but led the Colonels with five catches for 98 yards, including a 60-yard catch and run for a score in the fourth quarter. The game went into halftime scoreless, as neither team was able to get anything going offensively. All five of the Colonels offensive possession ended in punts while Lycoming punted three times, threw an interception and gave up a fumble. After each team traded punts to open the third quarter, Wilkes put together a nine-play, 57 yard drive which ended with the first score of the game, a 40-yard field goal from Chris Horn (New Tripoli, Northwestern Lehigh) at the 7:46 mark. Both Wilkes and Lycoming would trade possessions without moving the ball much, until Lycoming drove down into Wilkes territory in the beginning of the fourth quarter. After a timeout on fourth down and one to go, the Warriors decided to try to convert, but instead fumbled the snap and gave the ball, and the momentum, back to Wilkes. Wasting little time, the Colonels took advantage of the turnover on the third play of the drive, as Tivald took caught a crossing pass over the middle from Tyler Berntsen (Long Valley, NJ, West Morris Central), made a move, and bolted 60 yards for a score to put Wilkes up 10-0 with 13:01 left in the game. Lycoming then responded with a score of its own, putting together an eight-play, 82-yard drive, ending with a 23-yard touchdown pass from Zach Klinger to Ryan Wagaman. With 9:28 left, the Warriors were down 10-7. The Colonels didn't allow Lycoming to grab any momentum, driving down the field for another touchdown to go back on top by 10, 17-7. Berntsen connected on 2-of-3 passes, including a 16-yard first down completion to Jordan D'Emilio (Stowe, Saint Pius X), and last week's hero, freshman running back Auxence Wogou (Hackettstown, NJ, Hackettstown), lined up in the shotgun, taking three straight direct snaps and running for 11 yards before Tivald busted a 24-yarder up the right side for the score. Lycoming promptly went to its hurry-up offense, moving the ball down the field as Klinger completed five passes and ran twice for 32 yards. But the Colonels defense stepped up when it had to, when, on first-and-goal from the three, Gerhart intercepted Klinger's pass at the goal line and raced 100 yards, bobbing and weaving around defenders, to put Wilkes up 24-7 with 2:55 left in the game. After a penalty pushed the Wilkes kickoff back 15 yards, another Colonels penalty at the end of the runback gave the Warriors the football at the Wilkes 28-yard line. Wasting little time, Lycoming capitalized, as Klinger ran it in from nine yards out on the fifth play, bringing the score to 24-14 with 1:51 remaining. After the ensuing onside kick was recovered by D'Emilio, Wogou lined up for Wilkes in the shotgun again, and on the second play of the drive, took the direct snap up the middle for 38 yards and another touchdown. The Wilkes lead was 31-14 and the final 1:35 ticked away for the Colonels 17-point victory. The Colonels held Josh Kleinfelter, the MAC's leading rusher, to just 56 yards on 14 carries. Klinger finished 27-of-44 for 237 yards, a touchdown and two interceptions while Wagaman grabbed 15 catches, one short of the Lycoming single-game record, for 176 yards and a score. Wogou led all rushers with 87 yards, averaging 6.2 yards on his 14 carries. Berntsen finished 11-of-27 for 205 yards and a touchdown through the air and added 41 yards on the ground on 14 carries. D'Emilio added four catches for 78 yards. Tate Moore-Jacobs (New Cumberland, Cedar Cliff) had 13 tackles, his eighth straight game with double-digit stops. Gerhart added six tackles to his two interceptions and Harry Reese (Plymouth, Wyoming Valley West) added seven stops, including one behind the line of scrimmage. The Colonels, now 5-3 on the season and 4-1 in the MAC, will go on the road next week as they travel to Chester to take on Widener University. The Pride fell today to Lebanon Valley, 42-38, and are now 3-5 on the season (2-3 in the MAC). Kickoff next week is set for 1:00 p.m.